These lovely boxes are not modular. The name is cake box however considering the resulting size of the box they are better for home made biscuits or home made candies and little chocolates. If you need to make a bigger one I advise making in canson or very strong paper; I have made one box (the dome like one without the flower) for a cake with 22 cm of diameter with the kraft paper, it was cute but not as strong as expected. However the cake was good and everyone though that the box was really cute and simple. 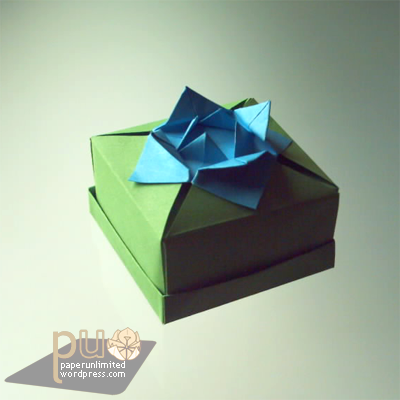 Each box is made by 3 or 4 pieces of square paper; 3 pieces without the flower, 4 pieces with the flower. The simplest box is made by a body, a bottom to cover the body interior and a lid. The other are similar, the only difference is a flower in the lid. 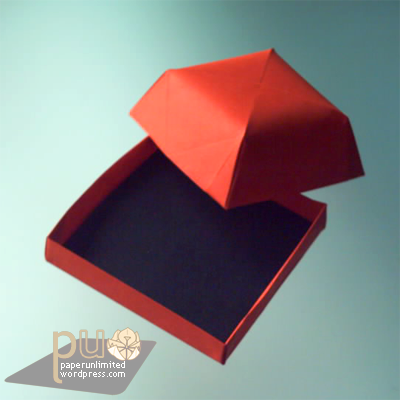 The red boxes were made with regular copy paper: 14×14 cm paper gives you a 7.5×7.5×3.5 cm box. 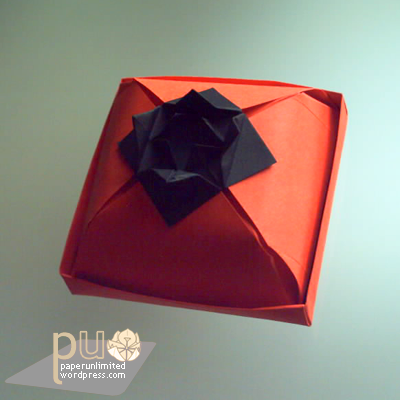 The flowers in both the red and green box were made with 7×7 cm paper. The green box is 5x5x3 and was also made with 14×14 copy paper. I’m planning on putting a step by step instruction to at least one of the boxes in the next week :) Stay tuned! You can find these and many more diagrams, including some modular, in Home decorating with Origami by Tomoko FUSE, Japan Publications Trading Company edition. This entry was posted on 2007|05|03 at 17:34 and is filed under origami. You can follow any responses to this entry through the RSS 2.0 feed. You can leave a response, or trackback from your own site. hi! could i please know how to make this.